Discussion in 'ASUS Gaming Notebook Forum' started by sicily428, May 30, 2017. I asked some photos about cooling system!! triturbo, jaug1337, RMSMajestic and 1 other person like this. I ****ING CALLED IT! HELL YEAH! People told me "no way, they can't fit the 8-core CPUs on there even if they are 65W"
Anyhow, I wonder what the clockspeed will be but regardless, this will be one hell of a powerhouse. Probably the best rendering/streaming/editing/heavy work laptop on the market seeing as the highest we get out of Intel is a quad-core with HT. I would've liked a Vega dGPU but hey, considering it doesn't look that thick or massive, I'm not complaining. Hopefully thermals are good enough to allow for a comfortable 3GHz clockspeed. triturbo, RMSMajestic and sicily428 like this. The biggest advantage of FreeSync over notebook Gsync is it doesn't eat your battery-life since Optimus doesn't work with Gsync, which completely turns off the iGPU. Then again Ryzen 7 doesn't have an iGPU so it doesn't benefit from FreeSync either. Raven Ridge on the other hand should work great with Enduro and FreeeSync. ChanceJackson and don_svetlio like this. It's definitely a good first step. I'm definitely more excited to see Vega. I'd love to see them start putting these kinds of chips on thinner and lighter laptops, like the gs73vr. They've definitely made a big leap from before though. The Republic of Gamers has been working with AMD for more than a decade. Our very first product, the original Crosshair motherboard, was designed for Athlon 64 FX processors. But we’ve never made a gaming laptop with an AMD CPU—until now. The new ROG Strix GL702ZC marries the latest Ryzen processors with Radeon RX 580 graphics to create a portable gaming machine with versatile horsepower. The 17.3” display is available in multiple configurations, including a 4K derivative that tops out at 60Hz, plus 1080p variants at 75Hz and 120Hz. The high-resolution option is great for content creators and gamers who play less demanding titles, while the high-refresh alternative is ideal for action-packed shooters and fast-paced play. All of them support AMD’s FreeSync tech, which synchronizes the display’s refresh rate with the GPU’s frame rate to minimize stuttering that can compromise smooth gameplay. In addition to compensating for performance wrinkles, FreeSync lowers input lag and eliminates visual tearing, resulting in fewer disruptions to your sense of immersion. IPS-type panels ensure wide viewing angles across the board. Washed-out colors are the last thing you want when playing split-screen Rocket League or chilling with Netflix and a friend. The displays also have matte coatings that minimize distracting glare and reflections that can divert your focus from the on-screen action. Despite accommodating desktop-class hardware, the Strix GL702ZC is easy to carry around town or to the next LAN party. The chassis is only 1.3” thick and weighs less than 7 lbs. 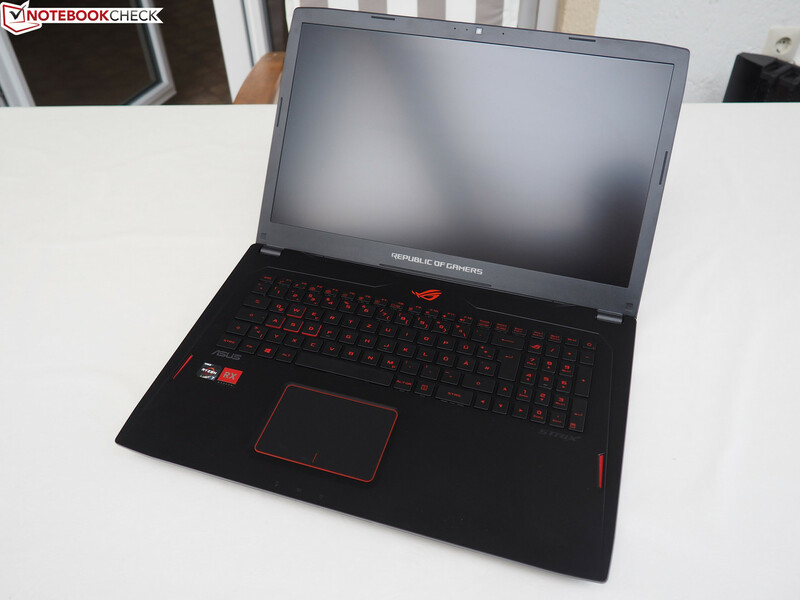 While that’s still a fair bit larger than ROG’s ultra-slim Zephyrus GX501, it’s still reasonable in the context of typical gaming laptops, especially considering what’s inside. The black exterior and brushed aluminum lid set the appropriate gaming tone. So does the red backlighting behind the keyboard and the colored caps for the WASD keys. With 30-key rollover, you can mash the keys frantically in the heat of battle and still be assured that your inputs are registered precisely. The relatively deep 1.6 mm of key travel further improves input by minimizing accidental presses. The motherboard tucked under the keyboard sports dual SO-DIMM slots with support for up to 32GB of DDR4-2400 memory. It also has an M.2 slot for NVMe SSDs up to 512GB. Pre-built configurations push storage throughput to 2200MB/s, which is several times the speed of SATA-based SSDs. You can add one of those if you want, too; the chassis has a 2.5” drive bay ready for mechanical or solid-state drives. All told, the GL702ZC can be crammed with enough memory and storage for a potent portable workstation with a massive game library. There’s no shortage of external connectivity, either. Gamers will appreciate the wired Gigabit Ethernet jack, which provides a reliably low-latency connection for multiplayer. The onboard 802.11ac Wi-Fi sends and receives through a 2x2 antenna that improves reception for wireless networks, while Bluetooth 4.1 stands ready to interface with mobile devices and wireless peripherals. Auxiliary displays can be powered via DisplayPort and HDMI 2.0, both of which are capable of pushing 4K at 60Hz. And there’s the requisite 3.5-mm audio jack for gaming headsets. USB is split between four ports: three Type-A for existing devices, plus one reversible Type-C for next-gen gear. The full-sized card reader is also powered by USB, allowing photographers and videographers to easily grab shots and footage from cameras. The ROG Strix GL702ZC will be available later this summer. Check with your local ROG representative for specifics on the configurations destined for your region. Looks like the product page is up too. Not even sure why this laptop is targeted towards gamers... I mean, I suppose it beats out the i7 7700hq... but I imagine it's going to have a hefty pricetag for it, with a gpu weaker than a 1060. Will wait for someone else to pick up Ryzen. Fingers crossed.